← The Future of Food – Fake Meat? The processes of photosynthesis and respiration are essentially inverse reactions. Photosynthesis uses carbon dioxide and water as reactants to produce glucose and oxygen gas. Respiration uses glucose and oxygen gas as reactants to produce carbon dioxide and water. The only difference is that photosynthesis requires an input of light energy to drive the reaction, energy which is stored in the C-H bonds of the glucose molecules produced. Here you will find the instructions for Lab 31C Photosynthesis-Respiration (CO2 and O2), which I originally planned for the day we return from the break. Unfortunately, most of the science department order has not yet arrived, including our new oxygen sensors, which means we don’t have enough equipment for everyone to get to do the lab. But thanks to modern technology, we can still run the lab virtually! Open the document and read the questions and extensions after the procedure and data tables. These should help guide your thinking with the photosynthesis/respiration labs you’re designing on your own. Photosynthesis-respiration lab setup. Screen capture image from Vernier LoggerPro software. 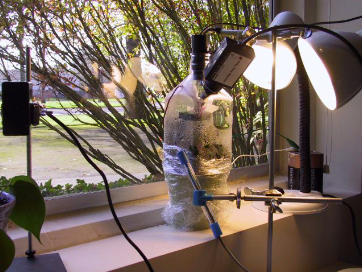 This entry was posted in Grade 9 Science and tagged biology, lab experiment, photosynthesis, respiration. Bookmark the permalink.